Foosball under the sun or stars. Great selection from the top manufacturers. All at low prices with free delivery! You can't beat a game of foosball with friends, but how about a game outdoors? 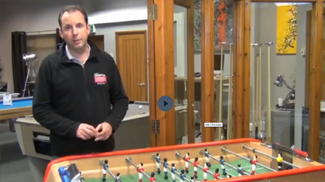 We have a superb range of high quality foosball tables that you can use outside. Think of the fun to be had with family and friends at your next barbecue or family gathering. All our outdoor football tables are designed to be used and stored outside. They come with a cover to protect them from the elements when not being used. Just make sure if you do get a sudden down pour you pop the cover on quickly so the pitch doesn't fill with water! As with everything sold by Home Leisure Direct we carefully select the best products from the top manufacturers. If it doesn't pass our quality testing it doesn't get listed on our website. You can even get them with a coin mechanism, perfect if you want to use them commercially in a beer garden for example. Simply tell us what you want to charge and we'll get the table set up for you so you can install it and start earning straightaway. For further advice on outdoor table football tables please call our friendly experts on 0800 622 6464 and we'll be happy to help.